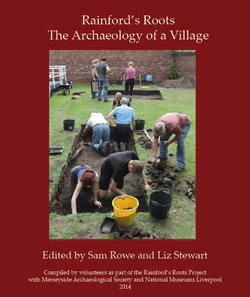 The Society in collaboration with National Museums Liverpool brought out the first of two publications on the Rainford’s Roots Community Archaeology Project in October 2014. The Rainford’s Roots Community Archaeology Project was established by Merseyside Archaeological Society and National Museums Liverpool and launched in January 2013, after receiving funding from the Heritage Lottery Fund. The project sought to investigate the rich early post-medieval industrial heritage of Rainford village. Through a series of surveys, excavations, and finds analysis, the project shed light on the pottery and clay tobacco pipe manufacturing industries that thrived in Rainford from the 17th-20th centuries. Martin Cox (towns and markets), Ron Dagnall (clay pipes, the tennis courts and other digs), Maurice Handley (geology and natural resources), Allan Moore (railways and transport), Peter Keen (canals) and Glyn Quigley (the Stanleys and Lathom). Other research has been contributed by NML staff: Mark Adams (the tennis courts dig), Ron Cowell (prehistory), and Jeff Speakman (ceramics and the library dig). The second of two publications resulting from the Rainford's Roots community archaeology project was published in July 2015. The monograph presents the results of archaeological and historical research in the village of Rainford, near St Helens, Merseyside. The manufacture of pottery and clay tobacco pipes became an important cottage industry for the local community. Archaeological excavations between 2011 and 2014 as part of the Rainford’s Roots Community Archaeology Project, undertaken with a grant from the Heritage Lottery Fund, focused on these industries and produced regionally significant groups of 16th- and 17th-century pottery, and clay tobacco pipes dating from the 17th through to the early 20th century. This book explores the fresh evidence from the excavations, including detailed reports of work at at 87 Church Road which produced evidence of a 17th-century pottery workshop, sealing a ditch in which a sizable collection of late 16th-century pottery had been dumped. The Rainford Library excavations on the site of a pipe shop, and watching brief on no 91 Church Road, have shed light on pottery and pipe production from the 17th to 19th centuries. 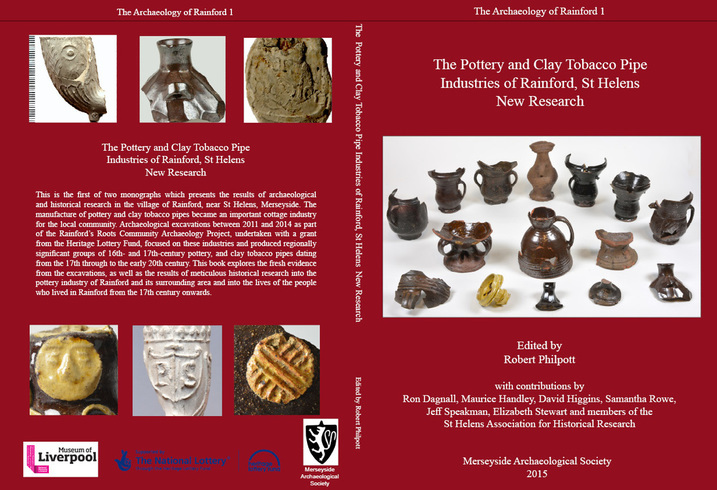 There are also the results of meticulous historical research into the pottery industry of Rainford and its surrounding area by Ron Dagnall, including an important documentary record of potters, compiled over many years' research. Other transcriptions of Rainford wills and inventories have been contributed by the St Helens Association for Historical Research. Ron has also contributed a series of transcriptions of inventories and wills of Rainford potters from the early 17th century onwards, of great value to historians and genealogical researchers alike. The book is available from the Publications Secretary, and the Museum of Liverpool bookshop. Price £20 (reduced price for current Merseyside Archaeological Society members £16), plus £4 postage.